Unique and Chic Red and White Spotted Hand Enamelled Little Starfish Shaped T-Bar Back, Sterling Silver Cufflinks. In our smart black box. Unique and Chic Red Hand Enamelled Apple Shaped T-Bar Back, Sterling Silver Gold-Plated Cufflinks. In our smart fitted black box. 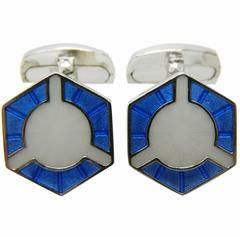 Handsome 18K white gold yacht shaped cufflinks by Trianon. Approx. retail price $4000. Hallmarks: Trianon maker's mark, 750. A chic set of Bulgari cufflinks crafted in 18k white gold adorned with 2 round brilliant cut diamonds. A rare pair of Bulgari cufflinks, in 18k yellow gold. These are detailed with a fine white enamel pattern to the border. The centres are an engine turned effect. Pair of 18k yellow gold cufflinks by David Webb, set with black and white enamel top. Cufflink top is 14.2mm in diameter, weigh 16.8 grams. Marked: Webb and 18k.